You may wonder how in the world you can make mistakes with data that is being delivered to you in neat reports and graphs. Social media metrics services do a great job of gathering any and all data you tell them to find, after all. There are many metrics pitfalls out there. You can easily avoid most of them with a little planning and a different outlook on what you want your metrics to do for you. Metrics excite some people, but for many, they’re math. Math has this stigma of being boring (even when the information it gives us is useful), so sometimes you see metrics that are inflated or otherwise altered to be more exciting. Avoid this mistake. One problem is that it makes people stop listening to you if your numbers always come in overstated. Another is that is calls all your data into question and helps no one. There is no shame in a low metric, if it’s true. A low metric is simply an opportunity to improve your efforts or improve your data collection. It’s a way to open up discussion on the underlying issue that is causing the low number. Low metrics may not look valuable on the surface, but they are often the most valuable number you can receive — a chance for improvement. Checking your metrics daily is often a bad idea. Unless you’re running a well-targeted, well-planned, multichannel 24- or 48-hour campaign, most daily metrics don’t give you the whole picture. You see, data takes time to become useful. The better (and more sanity-inducing) way to handle metrics is to check them by campaign date, weekly, or monthly. This timeframe also gives you more useful ways to compare metrics across time, as you’ll have a more substantial data set to work with. Segmenting metrics is often overlooked by folks that are new to analytics, but it’s an essential skill. Take the time to find out how to segment metrics for your campaigns. It will give you better data. Track these segments over a week or two to find out how the data is structured. After that time, you can go back in and add custom segments. As you layer your data by segment in addition to visitor flow, you get a more realistic picture of how your customers are engaging with your brand and what kind of work you need to do to improve. 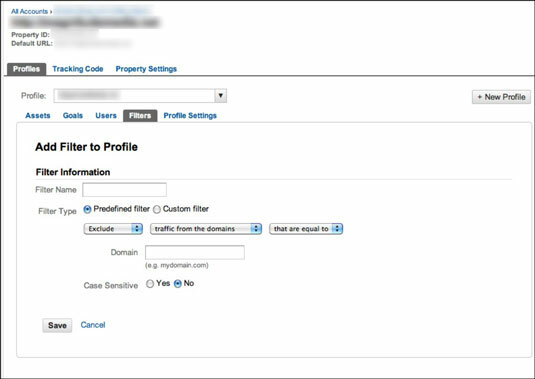 Google Analytics gives you a way to exclude certain IP addresses, including your own. This exclusion is useful if you know you have staff members who interact with your site for testing, your mom clicks your page every day, or other visitors come by that are loyal fans, but not necessarily relevant data. Choose the domain URL you want to work with. From the page that pops up, click the gear symbol on the right side of the orange toolbar. Click the Add a New Filter button. Add the IP that you want to filter out. If you want to get advanced, you can also filter them in to track repeat customers flow. Repeat Steps 1 through 7 as many times as you need to fine-tune your metrics.